Pardon the offenses of your peoples, we pray, O Lord, and in your goodness set us free from the bonds of the sins we have committed in our weakness. Through our Lord Jesus Christ, your Son, who lives and reigns with you in the unity of the Holy Spirit, one God, for ever and ever. Historically today is the feast of St. Julius, a Roman who was chosen Pope on the 6th of February in 337. He ruled the Church until 352 and received the appeal from St. Athanasius, whom he defended against his Arian accusers. The letter he wrote to the East on this occasion is one of the most momentous pronouncements of the Roman See. He built several churches in Rome and ranks as one of the most distinguished occupants of the Holy See. With Pope St. Julius the Papacy finds at its doorstep the vexing problem of the Eastern Arians. It is true that the Council of Nicaea had condemned Arianism, but in spite of that Arians had been growing in strength and had even gained the ear of Constantine, and what was more crucial, that of his son Constantius who succeeded him in the East. The man who was compelled to face the problem was Julius, a Roman who had been chosen to succeed Mark after an unexplained interval of four months. He soon received delegates from Alexandria asking him to acknowledge a certain Pistus as bishop of Alexandria in place of Athanasius, the mighty fighter for orthodoxy. The delegates tried to prove that Athanasius, who actually had been the victim of Arian intrigue, had been validly deposed. Athanasius on his part also sent envoys and later came to Rome in person to plead his case before the Pope. The Arians asked Julius to hold a synod to decide the case, but when in 341 Julius actually did convene it, they refused to attend. The Pope held it without them and over fifty bishops decreed that Athanasius had been unjustly condemned. Julius informed the Arians at Alexandria of this decision and let them know that he was displeased at their uncooperative attitude. The Emperor Constans, who ruled in the West, was favorable to the orthodox Christians while his brother Constantius, who ruled the East, was pro Arian. At this time both Emperors agreed to hold a big general council to see if religious unity could be achieved. 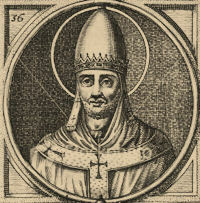 Pope Julius approved of the plan and sent legates to Sardica, the modern Sofia, where the council gathered. The council did not achieve religious unity because the Arians, when they found themselves outnumbered, walked out. The council once again vindicated Athanasius and once more repeated the solemn Nicene Creed. It also left an interesting set of regulations on the manner in which appeals to the pope should be made. In spite of the repeated vindications of Athanasius, that good man was unable to return to his see. Emperor Constans supported the Arian George until the usurper died. Then and only then was the long-suffering Athanasius allowed to go home. Pope Julius, delighted, wrote a letter to the people of Alexandria, congratulating them on the return of their true bishop. At Rome the number of Christians continued to grow during the pontificate of Julius. He built two new basilicas and three cemetery churches. The stay of St. Athanasius at Rome helped to popularize Egyptian monasticism and gave an impetus to religious life there. Pope St. Julius died April 12, 352. He was buried in the Cemetery of Calepodius. 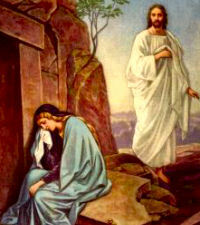 His feast is kept on April 12. The Station, at Rome, is in the church of St. Stephen on Monte Celio (Rotunda at the Coelian). This church of the great proto-martyr was chosen as the place where the faithful were to assemble on the Friday of Passion week.